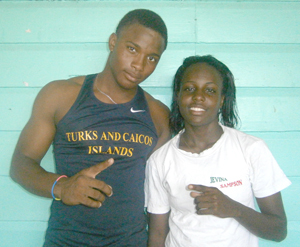 Kevin Abbensetts (left) and Jevina Sampson were the pick of athletes. while another similarly vociferous bunch lined the southern parameters in support of their choice when athletes from schools in the North Georgetown District (11) competed in the Inter Zone School’s Athletic Championships at the Police Sports Complex Ground, Eve Leary yesterday morning. Over 200 athletes from 25 schools competed in 58 events and when the smoke was cleared, Zone Two had amassed 939 points to claim the honours from Zone One with 908 points. Zone Three sealed off the third place spot after finishing with 704 points with Zone Four ending in the cellar with 217 points. Zone Four’s 4th place position certainly did not reflect their general performance as those athletes had only participated in events in the Under-12 category. There were sterling performances that really excited the crowd and though there was no announcement of which athlete had copped top prizes for individual performances, several of these athletes certainly would have been in contention. In the women’s category, Jevina Sampson stood out after dominating in the 100, 200 and 400 meters events. She also successfully anchored the 4 x 100 relay for her team. Kevin Abbensetts started the day with a compelling victory in the long jump after covering a length of 6.09 meters. He returned to take the 100 and 200 meters races but his team had to be content with second place in the 4 x 100 relay event. There were also sterling displays from several athletes out of the Running Brave Athletics Club with Sherwin Sampson carting off the honours in the Boys Under-12, 200 and 400 meters races; he finished second place in the 100 meters dash. There were also good performances from Yescina Andrews who copped first place in the Girls Under-12, 100, 200 and 400 meters races. Moriah Urquhart ran in the Under-14 category and won the 800 and 1500 meters events while Avon Samuels dominated the Under-16 category with wins in the 100, 200, 400 meters and the long jump. Devon Benjamin was also in winners’ row with compelling victories in the Boys’ Under-14, 100 meters dash and long jump. The schools in the respective zones are Queens College, Richard Ishmael, Kingston, GTI and Marian Academy (Zone 1); Chase Academy, Christ Church, St. John’s College, Bishops and School of the Nations (Zone 2), St. Roses, Business Education, St. Mary’s and St Georges (Zone 3) and St Ambrose, St. Agnes, St. Margaret’s, Winfer Gardens, St. Angelas and North Georgetown Primary (Zone 4).